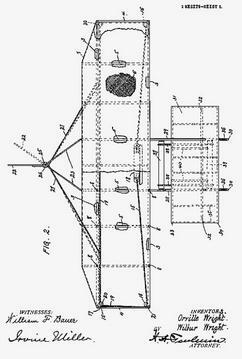 his is the final form of Wilbur and Orville Wright's patent for "new and useful improvements in Flying-Machines." ORVILLE WRIGHT AND WILBUR WRIGHT, OF DAYTON, OHIO. No 821,393. Specification of Letters Patent. Patented May 22, 1906. 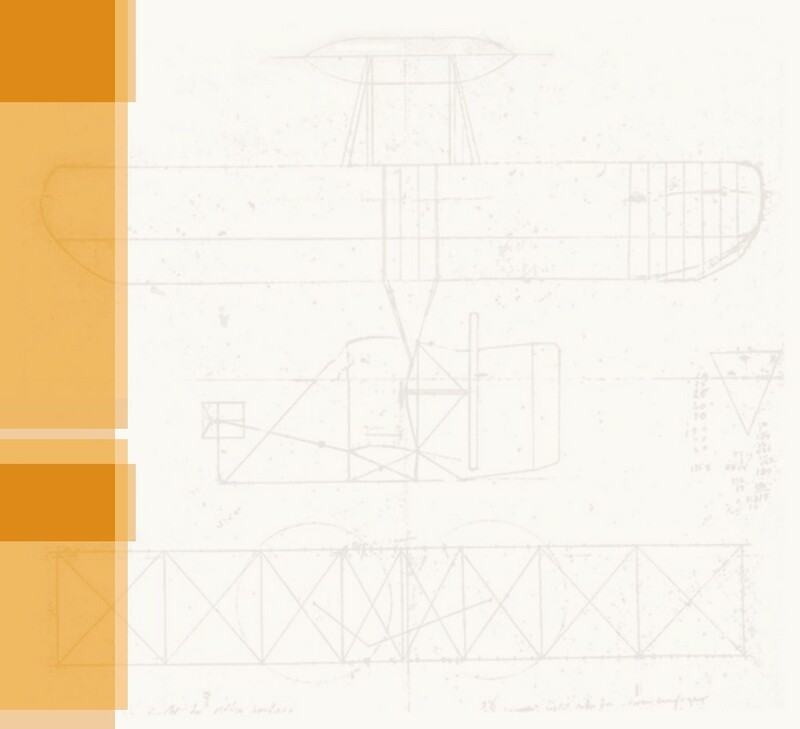 To all whom it may concern: Be it known that we, ORVILLE WRIGHT and WILBUR WRIGHT, citizens of the United States, residing in the city of Dayton, county of Montgomery, and State of Ohio, have in vented certain new and useful Improvements in Flying-Machines, of which the following is a specification. 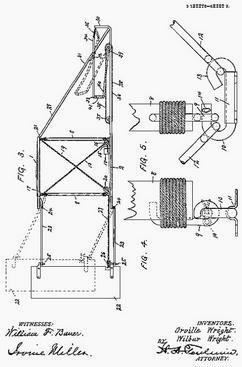 Our invention relates to that class of flying machines in which the weight is sustained by the reactions resulting when one or more aeroplanes are moved through the air edgewise at a small angle of incidence, either by the application of mechanical power or by the utilization of the force of gravity. The objects of our invention are to provide means for maintaining or restoring the equilibrium or lateral balance of the apparatus, to provide means for guiding the machine both vertically and horizontally, and to provide a structure combining lightness, strength, convenience of construction, and certain other advantages which will hereinafter appear. of the upper aeroplane, where they are attached, as indicated at 17. To the central portion of this rope there is connected a laterally-movable cradle 18, which forms a means for moving the rope lengthwise in one direction or the other, the cradle being movable toward either side of the machine. We have devised this cradle as a convenient means for operating the rope 15, and the machine is intended to be generally used with the operator lying face downward on the lower aeroplane, with his head to the front, so that the operator's body rests on the cradle, and the cradle can be moved laterally by the movements of the operator's body. It will be understood, however, that the rope 15 may be manipulated in any suitable manner. 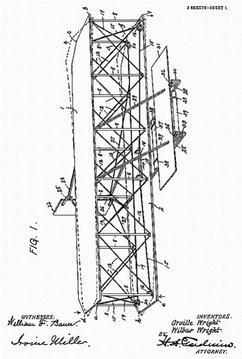 19 indicates a second rope extending transversely of the machine along the rear edge of the body portion of the lower aeroplane, passing under suitable pulleys or guides 20 at the rear corners g and h of the lower aeroplane, and extending thence diagonally upward to the front corners a and b of the upper aeroplane, where its ends are secured in any suitable manner, as indicated at 21. Considering the structure so far as we have now described it and assuming that the cradle 18 be moved to the right in Figs. 1 and 2, as indicated by the arrows applied to the cradle in Fig. 1 and by the dotted lines in Fig. 2, it will be seen that that portion of the rope 15 passing under the guide-pulley at the corner e and secured to the corner d will be under tension, while slack is paid out throughout the other side or half of the rope 15. The part of the rope 15 under tension exercises a downward pull upon the rear upper corner d of the structure and an upward pull upon the front lower corner e, as indicated by the arrows. This causes the corner d to move downward and the corner e to move upward. As the corner e moves upward it carries the corner a upward with it, since the intermediate standard 8 is substantially rigid and maintains an equal distance between the corners a and e at all times. Similarly, the standard 8, connecting the corners d and h, causes the corner h to move downward in unison with the corner d. Since the corner a thus moves upward and the corner h moves downward, that portion of the rope 19 connected to the corner a will be pulled upward through the pulley 20 at the corner h, and the pull thus exerted on the rope 19 will pull the corner b on the other side of the machine downward and at the same time pull the corner g at said other side of the machine upward. This results in a downward movement of the corner b and an upward movement of the corner c. Thus it results from a lateral movement of the cradle 18 to the right in Fig. 1 that the lateral margins a d and e h at one side of the machine are moved from their normal positions, in which they lie in the normal planes of their respective aeroplanes, into angular relations with said normal planes, each lateral margin on this side of the machine being raised above said normal plane at its forward end and depressed below said normal plane at its rear end, said lateral margins being thus inclined upward and forward. At the same time a reverse inclination is imparted to the lateral margins b c and f g at the other side of the machine, their inclination being downward and forward. These positions are indicated in dotted lines in Fig. 1 of the drawings. A movement of the cradle 18 in the opposite direction from its normal position will reverse the angular inclination of obvious manner. By reason of this construction it will be seen that with the particular mode of construction now under consideration it is possible to move the forward corner of the lateral edges of the aeroplane on one side of the machine either above or below the normal planes of the aeroplanes, a reverse movement of the forward corners of the lateral margins on the other side of the machine occurring simultaneously. During this operation each aeroplane is twisted or distorted around a line extending centrally across the same from the middle of one lateral margin to the middle of the other lateral margin, the twist due to the moving of the lateral margins to different angles extending across each aeroplane from side to side, so that each aeroplane surface is given a helicoidal warp or twist. We prefer this construction and mode of operation for the reason that it gives a gradually-increasing angle to the body of each aeroplane from the central longitudinal line thereof outward to the margin, thus giving a continuous surface on each side of the machine, which has a gradually increasing or decreasing angle of incidence from the center of the machine to either side. We wish it to be understood, however, that our invention is not limited to this particular construction, since any construction whereby the angular relations of the lateral margins of the aeroplanes may be varied in opposite directions with respect to the normal planes of said aeroplanes comes within the scope of our invention. Furthermore, it should be understood that while the lateral margins of the aeroplanes move to different angular positions with respect to or above and below the normal planes of said aeroplanes it does not necessarily follow that these movements bring the opposite lateral edges to different angles respectively above and below a horizontal plane, since the normal planes of the bodies of the aeroplanes are inclined to the horizontal when the machine is in flight, said inclination being downward from front to rear, and while the forward corners on one side of the machine may be depressed below the normal planes of the bodies of the aeroplanes said depression is not necessarily sufficient to carry them below the horizontal planes passing through the rear corners on that side. Moreover, although we prefer to so construct the apparatus that the movements of the lateral margins on the opposite sides of the machine are equal in extent and opposite in direction, yet our invention is not limited to a construction producing this result, since it may be desirable under certain circumstances to move the lateral margins on one side of the machine in the manner just described without moving the lateral margins on the other side of the machine to an equal extent in the opposite direction. Turning now to the purpose of this provision for moving the lateral margins of the aeroplanes in the manner described, it should be premised that owing to various conditions of wind-pressure and other causes the body of the machine is apt to become unbalanced laterally, one side tending to sink and the other side tending to rise, the machine turning around its central longitudinal axis. The provision which we have just described enables the operator to meet this difficulty and preserve the lateral balance of the machine. Assuming that for some cause the side of the machine which lies to the left of the observer in Figs. 1 and 2 has shown a tendency to drop downward, a movement of the cradle 18 to the right of said figures, as hereinbefore assumed, will move the lateral margins of the aeroplanes in the manner already described, so that the margins a d and e h will be inclined downward and rearward and the lateral margins b c and f g will be inclined upward and rearward with respect to the normal planes of the bodies of the aeroplanes. With the parts of the machine in this position it will be seen that the lateral margins a d and e h present a larger angle of incidence to the resisting air, while the lateral margins on the other side of the machine present a smaller angle of incidence. Owing to this fact, the side of the machine presenting the larger angle of incidence will tend to lift or move upward, and this upward movement will restore the lateral balance of the machine. When the other side of the machine tends to drop, a movement of the cradle 18 in the reverse direction will restore the machine to its normal lateral equilibrium. Of course the same effect will be produced in the same way in the case of a machine employing only a single aeroplane. 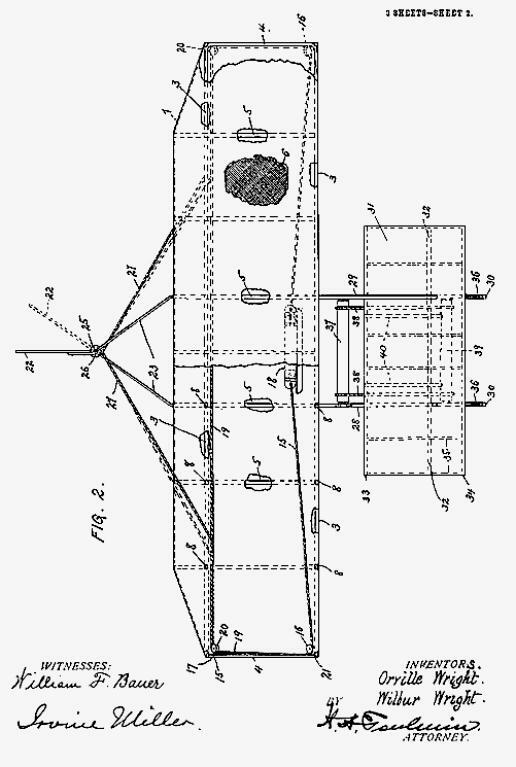 In connection with the body of the machine as thus operated we employ a vertical rudder or tail 22, so supported as to turn around a vertical axis. This rudder is supported at the rear ends of supports or arms 23, pivoted at their forward ends to the rear margins of the upper and lower aeroplanes, respectively. These supports are preferably V-shaped, as shown, so that their forward ends are comparatively widely separated, their pivots being indicated at 24. Said supports are free to swing upward at their free rear ends, as indicated in dotted lines in Fig. 3, their downward movement being limited in any suitable manner. The vertical pivots of the rudder 22 are indicated at 25, and one of these pivots has mounted thereon a sheave or pulley 26, around which passes a tiller-rope 27, the ends of which are extended out laterally and secured to the rope 19 on opposite sides of the central point of said rope. By reason of this construction the lateral shifting of the cradle 18 serves to turn the rudder to one side or the other of the line of flight. It will be observed in this connection that the construction is such that the rudder will always be so turned as to present its resisting-surface on that side of the machine on which the lateral margins of the aeroplanes present the least angle of resistance. The reason of this construction is that when the lateral margins of the aeroplanes are so turned in the manner hereinbefore described as to present different angles of incidence to the atmosphere that side presenting the largest angle of incidence, although being lifted or moved upward in the manner already described, at the same time meets with an increased resistance to its forward motion, and is therefore retarded in its forward motion, while at the same time the other side of the machine, presenting a smaller angle of incidence, meets with less resistance to its forward motion and tends to move forward more rapidly than the retarded side. This gives the machine a tendency to turn around its vertical axis, and this tendency if not properly met will not only change the direction of the front of the machine, but will ultimately permit one side thereof to drop into a position vertically below the other side with the aeroplanes in vertical position, thus causing the machine to fall. The movement of the rudder hereinbefore described prevents this action, since it exerts a retarding influence on that side of the machine which tends to move forward too rapidly and keeps the machine with its front properly presented to the direction of flight and with its body properly balanced around its central longitudinal axis. The pivoting of the supports 23 so as to permit them to swing upward prevents injury to the rudder and its supports in case the machine alights at such an angle as to cause the rudder to strike the ground first, the parts yielding upward, as indicated in dotted lines in Fig. 3, and thus preventing injury or breakage. We wish it to be understood, however, that we do not limit ourselves to the particular description of rudder set forth, the essential being that the rudder shall be vertical and shall be so moved as to present its resisting-surface on that side of the machine which offers the least resistance to the atmosphere, so as to counteract the tendency of the machine to turn around a vertical axis when the two sides thereof offer different resistances to the air. From the central portion of the front of the machine struts 28 extend horizontally for ward from the lower aeroplane, and struts 29 extend downward and forward from the central portion of the upper aeroplane, their front ends being united to the struts 28, the forward extremities of which are turned up, as indicated at 30. These struts 28 and 29 form truss-skids projecting in front of the whole frame of the machine and serving to prevent the machine from rolling over forward when it alights. The struts 29 serve to brace the upper portion of the main frame and resist its tendency to move forward after the lower aeroplane has been stopped by its contact with the earth, thereby relieving the rope 19 from undue strain, for it will be understood that when the machine comes into contact with the earth further forward movement of the lower portion thereof being suddenly arrested the inertia of the upper portion would tend to cause it to continue to move forward if not prevented by the struts 29, and this forward movement of the upper portion would bring a very violent strain upon the rope 19, since it is fastened to the upper portion at both of its ends, while its lower portion is connected by the guides 20 to the lower portion. The struts 28 and 29 also serve to support the front or horizontal rudder, the construction of which we will now proceed to describe. The front rudder 31 is a horizontal rudder having a flexible body, the same consisting of three stiff cross-pieces or sticks 32, 33, and 34, and the flexible ribs 35, connecting said crosspieces and extending from front to rear. The frame thus provided is covered by a suitable fabric stretched over the same to form the body of the rudder. The rudder is supported from the struts 29 by means of the intermediate cross-piece 32, which is located near the center of pressure slightly in front of a line equidistant between the front and rear edges of the rudder, the cross-piece 32 forming the pivotal axis of the rudder, so as to constitute a balanced rudder. To the front edge of the rudder there are connected springs 36, which springs are connected to the upturned ends 30 of the struts 28, the construction being such that said springs tend to resist any movement either upward or downward of the front edge of the horizontal rudder. The rear edge of the rudder lies immediately in front of the operator and may be operated by him in any suitable manner. We have shown a mechanism for this purpose comprising a roller or shaft 37, which may be grasped by the operator so as to turn the same in either direction. Bands 38 extend from the roller 37 forward to and around a similar roller or shaft 39, both rollers or shafts being supported in suitable bearings on the struts 28. The forward roller or shaft has rearwardly-extending arms 40, which are connected by links 41 with the rear edge of the rudder 31. The normal position of the rudder 31 is neutral or substantially parallel with the aeroplanes 1 and 2; but its rear edge may be moved upward or downward, so as to be above or below the normal plane of said rudder through the mechanism provided for that purpose. It will be seen that the springs 36 will resist any tendency of the forward edge of the rudder to move in either direction, so that when force is applied to the rear edge of said rudder the longitudinal ribs 35 bend, and the rudder thus presents a concave surface to the action of the wind either above or below its normal plane, said surface presenting a small angle of incidence at its forward portion and said angle of incidence rapidly increasing toward the rear. This greatly increases the efficiency of the rudder as compared with a plane surface of equal area. By regulating the pressure on the upper and lower sides of the rudder through changes of angle and curvature in the manner described a turning movement of the main structure around its transverse axis may be effected, and the course of the machine may thus be directed upward or downward at the will of the operator and the longitudinal balance thereof maintained. Contrary to the usual custom, we place the horizontal rudder in front of the aeroplanes at a negative angle and employ no horizontal tail at all. By this arrangement we obtain a forward surface which is almost entirely free from pressure under ordinary conditions of flight, but which even if not moved at all from its original position becomes an efficient lifting-surface whenever the speed of the machine is accidentally reduced very much below the normal, and thus largely counteracts that backward travel of the center of pressure on the aeroplanes which has frequently been productive of serious injuries by causing the machine to turn downward and forward and strike the ground head-on. We are aware that a forward horizontal rudder of different construction has been used in combination with a supporting-surface and a rear horizontal rudder; but this combination was not intended to effect and does not effect the object which we obtain by the arrangement hereinbefore described. We have used the term "aeroplane" in this specification and the appended claims to indicate the supporting-surface or supporting surfaces by means of which the machine is sustained in the air, and by this term we wish to be understood as including any suitable supporting-surface which normally is substantially flat, although of course when constructed of cloth or other flexible fabric, as we prefer to construct them, these surfaces may receive more or less curvature from the resistance of the air, as indicated in Fig. 3. We do not wish to be understood as limiting ourselves strictly to the precise details of construction hereinbefore described and shown in the accompanying drawings, as it is obvious that these details may be modified without departing from the principles of our invention. For instance, while we prefer the construction illustrated in which each aeroplane is given a twist along its entire length in order to set its opposite lateral margins at different angles we have already pointed out that our invention is not limited to this form of construction, since it is only necessary to move the lateral marginal portions, and where these portions alone are moved only those upright standards which support the movable portion require flexible connections at their ends. 1. In a flying-machine, a normally flat aeroplane having lateral marginal portions capable of movement to different positions above or blow the normal plane of the body of the aeroplane, such movement being about an axis transverse to the line of flight, whereby said lateral marginal portions may be moved to different angles relatively to the normal plane of the body of the aeroplane, so as to present to the atmosphere different angles of incidence, and means for so moving said lateral marginal portions, substantially as described. 2. In a flying-machine, the combination, with two normally parallel aeroplanes, superposed the one above the other, of upright standards connecting said planes at their margins, the connections between the standards and aeroplanes at the lateral portions of the aeroplanes being by means of flexible joints, each of said aeroplanes having lateral marginal portions capable of movement to different positions above or below the normal plane of the body of the aeroplane, such movement being about an axis transverse to the line of flight, whereby said lateral marginal portions may be moved to different angles relatively to the normal plane of the body of the aeroplane, so as to present to the atmosphere different angles of incidence, the standards maintaining a fixed distance between the portions of the aeroplanes which they connect, and means for imparting such movement to the lateral marginal portions of the aeroplanes, substantially as described. 3. In a flying-machine, a normally flat aeroplane having lateral marginal portions capable of movement to different positions above or below the normal plane of the body of the aeroplane, such movement being about an axis transverse to the line of flight, whereby said lateral marginal portions may be moved to different angles relatively to the normal plane of the body of the aeroplane, and also to different angles relatively to each other, so as to present to the atmosphere different angles of incidence, and means for simultaneously imparting such movement to said lateral marginal portions, substantially as described. 4. In a flying-machine, the combination, with parallel superposed aeroplanes, each having lateral marginal portions capable of movement to different positions above or below the normal plane of the body of the aeroplane, such movement being about an axis transverse to the line of flight, whereby said lateral marginal portions may be moved to different angles relatively to the normal plane of the body of the aeroplane, and to different angles relatively to each other, so as to present to the atmosphere different angles of incidence, of uprights connecting said aeroplanes at their edges, the uprights connecting the lateral portions of the aeroplanes being connected with said aeroplanes by flexible joints, and means for simultaneously imparting such movement to said lateral marginal portions, the standards maintaining a fixed distance between the parts which they connect, whereby the lateral portions on the same side of the machine are moved to the same angle, substantially as described. 5. In a flying-machine, an aeroplane having substantially the form of a normally flat rectangle elongated transversely to the line of flight, in combination with means for imparting to the lateral margins of said aeroplane a movement about an axis lying in the body of the aeroplane perpendicular to said lateral margins, and thereby moving said lateral margins into different angular relations to the normal plane of the body of the aeroplane, substantially as described. 6. In a flying-machine, the combination, with two superposed and normally parallel aeroplanes, each having substantially the form of a normally flat rectangle elongated transversely to the line of flight, of upright standards connecting the edges of said aeroplanes to maintain their equidistance, those standards at the lateral portions of said aeroplanes being connected therewith by flexible joints, and means for simultaneously imparting to both lateral margins of both aeroplanes a movement about axes which are perpendicular to said margins and in the planes of the bodies of the respective aeroplanes, and thereby moving the lateral margins on the opposite sides of the machine into different angular relations to the normal planes of the respective aeroplanes, the margins on the same side of the machine moving to the same angle, and the margins on one side of the machine moving to an angle different from the angle to which the margins on the other side of the machine move, substantially as described. 7. In a flying-machine, the combination, with an aeroplane, and means for simultaneously moving the lateral portions thereof into different angular relations to the normal plane of the body of the aeroplane and to each other, so as to present to the atmosphere different angles of incidence, of a vertical rudder, and means whereby said rudder is caused to present to the wind that side thereof nearest the side of the aeroplane having the smaller angle of incidence and offering the least resistance to the atmosphere, substantially as described. 8. In a flying-machine, the combination, with two superposed and normally parallel aeroplanes, upright standards connecting the edges of said aeroplanes to maintain their equidistance, those standards at the lateral portions of said aeroplanes being connected therewith by flexible joints, and means for simultaneously moving both lateral portions of both aeroplanes into different angular relations to the normal planes of the bodies of the respective aeroplanes, the lateral portions on one side of the machine being moved to an angle different from that to which the lateral portions on the other side of the machine are moved, so as to present different angles of incidence at the two sides of the machine, of a vertical rudder, and means whereby said rudder is caused to present to the wind that side thereof nearest the side of the aeroplanes having the smaller angle of incidence and offering the least resistance to the atmosphere, substantially as described. 9. In a flying-machine, an aeroplane normally flat and elongated transversely to the line of flight, in combination with means for imparting to said aeroplane a helicoidal warp around an axis transverse to the line of flight and extending centrally along the body of the aeroplane in the direction of the elongation of the aeroplane, substantially as described. 10. In a flying-machine, two aeroplanes, each normally flat and elongated transversely to the line of flight, and upright standards connecting the edges of said aeroplanes to maintain their equidistance, the connections between said standards and aeroplanes being by means of flexible joints, in combination with means for simultaneously imparting to each of said aeroplanes a helicoidal warp around an axis transverse to the line of flight, and extending centrally along the body of the aeroplane in the direction of the elongation of the aeroplane, substantially as described. 11. In a flying-machine, two aeroplanes, each normally flat and elongated transversely to the line of flight, and upright standards connecting the edges of said aeroplanes to maintain their equidistance, the connections between such standards and aeroplanes being by means of flexible joints, in combination with means for simultaneously imparting to each of said aeroplanes a helicoidal warp around an axis transverse to the line of flight and extending centrally along the body of the aeroplane in the direction of the elongation of the aeroplane, a vertical rudder, and means whereby said rudder is caused to present to the wind that side thereof nearest the side of the aeroplanes having the smaller angle of incidence and offering the least resistance to the atmosphere, substantially as described. 12. In a flying-machine, the combination, with an aeroplane, of a normally flat and substantially horizontal flexible rudder, and means for curving said rudder rearwardly and upwardly or rearwardly and downwardly with respect to its normal plane, substantially as described. 13. In a flying-machine, the combination, with an aeroplane, of a normally flat and substantially horizontal flexible rudder pivotally mounted on an axis transverse to the line of flight near its center, springs resisting vertical movement of the front edge of said rudder, and means for moving the rear edge of said rudder above or below the normal plane thereof, substantially as described. 14. A flying-machine comprising superposed connected aeroplanes, means for moving the opposite lateral portions of said aeroplanes to different angles to the normal planes thereof, a vertical rudder, means for moving said vertical rudder toward that side of the machine presenting the smaller angle of incidence and the least resistance to the atmosphere, and a horizontal rudder provided with means for presenting its upper or under surface to the resistance of the atmosphere, substantially as described. 15. 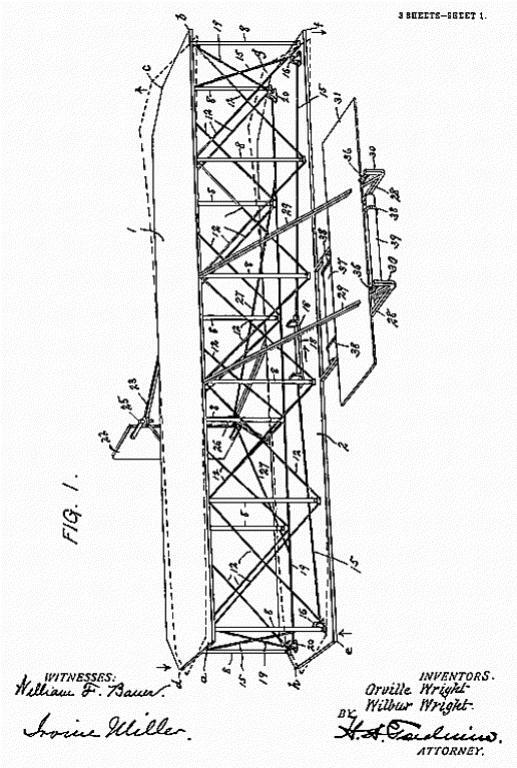 A flying-machine comprising superposed connected aeroplanes, means for moving the opposite lateral portions of said aeroplanes to different angles to the normal planes thereof, a vertical rudder, means for moving said vertical rudder toward that side of the machine presenting the smaller angle of incidence and the least resistance to the atmosphere, and a horizontal rudder provided with means for presenting its upper or under surface to the resistance of the atmosphere, said vertical rudder being located at the rear of the machine and said horizontal rudder at the front of the machine, substantially as described. 16. In a flying-machine, the combination, with two superposed and connected aeroplanes, of an arm extending rearward from each aeroplane, said arms being parallel and free to swing upward at their rear ends, and a vertical rudder pivotally mounted in the rear ends of said arms, substantially as described. 17. A flying-machine comprising two superposed aeroplanes, normally flat but flexible, upright standards connecting the margins of said aeroplanes, said standards being connected to said aeroplanes by universal joints, diagonal stay-wires connecting the opposite ends of the adjacent standards, a rope extending along the front edge of the lower aeroplane, passing through guides at the front corners thereof, and having its ends secured to the rear corners of the upper aeroplane, and a rope extending along the rear edge of the lower aeroplane, passing through guides at the rear corners thereof, and having its ends secured to the front corners of the upper aeroplane, substantially as described. 18. A flying-machine comprising two superposed aeroplanes, normally flat but flexible, upright standards connecting the margins of said aeroplanes, said standards being connected to said aeroplanes by universal joints, diagonal stay-wires connecting the opposite ends of the adjacent standards, a rope extending along the front edge of the lower aeroplane, passing through guides at the front corners thereof, and having its ends secured to the rear corners of the upper aeroplane, and a rope extending along the rear edge of the lower aeroplane, passing through guides at the rear corners thereof, and having its ends secured to the front corners of the upper aeroplane, in combination with a vertical rudder, and a tiller-rope connecting said rudder with the rope extending along the rear edge of the lower aeroplane, substantially as described. Figures 3,4, and 5 -- Side View and details.